Ok, so you want to trade some hot Penny Stocks. There is NOT a lot of reliable resources out there, most are scams and crappy alert services. However, there are two resources for stock trading these stocks in the stock market that I recommend. First, have a look at the chart below. 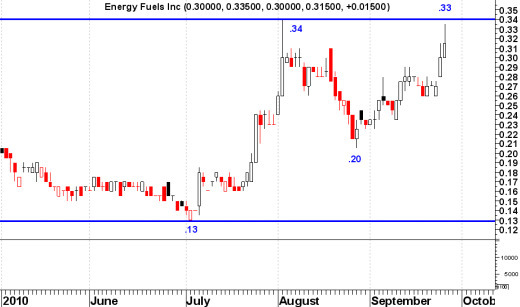 This stock went from .13 cents in early July to .34 cents in early August...a 162% increase...not bad eh'! Then down to .20 cents it went...and zoomed back up to .33 cents. A little bit volatile maybe? Well that's the world of a penny-stock. You can make a ton of dough quickly, but if you don't know what you are doing and are flying off the seat of your pants, you can lose a lot in a hurry too. Your knowledge of Technical Analysis and Risk and Money Management is very important. So is focus and commitment, with a good system. 1. The first Penny-Stock System is the Timothy Sykes Realtime Trade Alerts by famous Penny Stock Trader Timothy Sykes. Tim has a great story. In College, he skipped classes in favor of trading penny stocks every day, and turned $12,415 in Bar Mitzvah gift money, into $2.9 million and then started a hedge fund all before he was 30 years old! He was featured on "Wall St. Warriors", the reality TV series that focused on successful traders, hedge fund managers, and wall street players. He has been featured on CNN Money, Fox & Friends, Larry King and pretty much every major business and financial news outlet out there. Tim has consistently earned 140% or MORE year over year returns on the trades he makes and the methods that he teaches. He has over 5,000 students in more than 70 countries. Daily 5-10 pennystock watchlist from Tim's stock picks. Realtime SMS, Email, & Push Alerts. Access to chatroom with 1000+ active traders. Access to Tim's 3,500+ video lesson library. The video below is Tim at conference showing how he made a 30% gain on a stock in 30 minutes. 2. The second Penny-Stocks System I recommend is called Penny-Stocks Secrets Revealed by former Stock Broker and professional Stock Trader Jordan Scott. Now Jordan did not write the information contained in this E-book. Jordan spent countless hours going through website after website of the same recycled general information, spending thousands of dollars on newsletters and advisory services. He then found Somebody who told him the whole truth about making money trading Penny-Stocks. He then actually partnered with top experts in the field of Penny-Stock investing to have this book published. 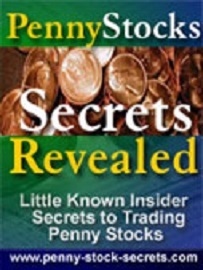 This e-book is packed with little known information tips and tricks on the insider secrets to picking winning penny stocks. A seven step formula for doing research on your penny-stocks list. Six proven strategies for picking penny-stocks that are practically forced to go up. Discover 7 news services that will tell you what mergers will happen. The perfectly legal way to get information on the company's plans before they announce them. Exactly how you can take your penny stock portfolio from $1000.00 to $40,000. 196 pages of power-packed tips, trading techniques and secrets, all revealed in a step-by-step, easy-to-understand format. This E-book will tell you exactly how to go about finding these Penny companies even though they have no earnings yet, and are still unheard of by the rest of the crowd, by using a little known technique. There is a Risk-Free, 60 day 100% Unconditional Money-Back Guarantee. Click here to research more. How To Really Make Money Trading Penny-Stocks! Have you used any of our recommended Penny Stocks Systems? Did you experience a positive impact from it? Share your personal experience and write your review including how it helped you the most for stock trading Penny Stocks in the stock market. Return From "Penny-Stocks System" to the Home Page "Stock Market For Beginners"